New Showroom Coming in 2019! 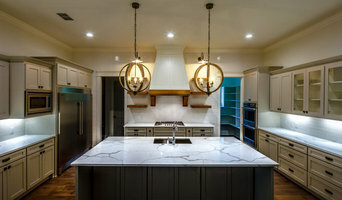 Rusk County's Full-Service Stone Specialists | 4x Best of Houzz! Bowie County's Choice for Flooring & Lighting Design! Clover Crete: Surface Solutions. Quality above all else. We design, build and install custom showers using natural stone, glass, mosaics and porcelain tile. We use tried and true methods combined with the latest waterproofing technology. There's strength behind the beauty of our work. We also have developed a new method of finishing a variety of surfaces using eco-friendly "micro-concrete" which can be applied faster and usually cheaper than a traditional tile/stone application. Check back often as we will soon be combining both of these methods to create something truly unique. A Plus Marble & Granite Designs is a Christian/Family based company. Striving to give, not only, quality service but a reputation we can be proud of. Having over 15 years of experience, no one like our professionals to know their trade and deliver high quality service like we do. It’s our pleasure and duty to treat you with the same respect that we would treat our family and friends. We are dedicated to steady growth through superior work and excellent customer service and our daily goal is to find more ways to make your experience first class, by keeping your interests first. Our knowledgeable and friendly installers will ensure that your floors, walls, and appliances are completely protected during the remodeling process. At the end of the day, your home will be left the way it was found—clean. Our staff will treat your home as if it was their own, protecting all your investments along the way. We have installed many granite counter tops for builders and homeowners alike in the New Orleans area. Most of which are referrals from past satisfied customers, resulting in a reputation of outstanding service and skilled craftsmanship. From the time your stone selection is complete we offer timely measurement s and suggestions for your project, first class fabrication, and impeccable installation. Delivering a painless and flawless process that will not only pay for itself but will have you and your family and friends talking about us for years to come. NOLA BOARDS manufactures and retails custom wooden countertops, islands and furniture as well as smaller artisan products and gifts for the kitchen and bar. Carr Stone & Tile, Inc.
Carr Stone and Tile, Inc. is a leading commercial and residential fabricator, installer and importer of natural stone including granite, marble, limestone, slate, flagstone, ceramic and porcelain tile and many other materials. Carr Stone and Tile, Inc. offers a fine selection of natural stone products that will add years of enjoyment and increased value to your project. Established in 1988, Carr Stone and Tile, Inc. combines many years of experience among the owners, salesman, supervisors, fabricators and installers. With our accumulated know how, we strive to satisfy architects, designers, contractors and individual homeowners. Our showroom and display yard are open daily, Monday through Friday from 9 a.m. to 4 p.m. Samples are available upon request. Our goal is to provide quality and craftsmanship on every project large or small. Specializing in kitchen and bath renovations including marble and granite fabrication and installation. We do luxury tile work , showers , travertine , natural stone and kitchen backsplash and more. Marques Countertops is a family owned business located in Chalmette, Louisiana. We have been servicing our industry since 1996, specializing in Solid Surface, Quartz, Granite, Marble, and Recycled Glass, in the commercial and residential markets. We utilize the latest technologies in cnc and waterjet tooling to ensure the best quality and accuracy available. If you can't find it with us, chances are, it doesn't exist! Worktop installers and tilers in New Orleans, LA can advise on the best tiles and materials to use based on your tastes and requirements and then will be able to install them to a high finish in your home. Kitchen worktops are a major part of your kitchen – you need surfaces that will be scratch and heat resistant, but at the same time still look attractive and work in harmony with your kitchen units, splashback and other kitchen elements. A worktop manufacturer and installer will be able to fit new kitchen worktops or replace old ones with ease, helping you to pick out the best kitchen worktops for your home first. Tiles are so versatile that they can be used in kitchen splashbacks, floors, bathroom walls and as decorative designs elsewhere in the house. Tile manufacturers and tilers in New Orleans, LA will have a great range of tile designs, sizes and materials to choose from and will help you to pick the best tile for the job. Laying tiles may look easy sometimes, but one badly laid tile can ruin a whole floor or wall, so it’s really best to leave it to a skilled tiler. With Houzz you can find New Orleans, LA tilers, tile manufacturers and worktop installers near you and check their previous projects, reviews and ratings to decide if they’re a good fit for your home design project. Why should I hire worktop installers or tilers in New Orleans, LA? Perfectly laid tiles and worktops can look simple and seamless once finished, but installing them is far harder than it looks. It really pays off to hire a New Orleans, LA tiler or worktops professional as they will have the experience and expertise to finish the job efficiently, quickly and to a high quality. From metro bathroom tiles and porcelain tiling, to kitchen worktops, splashbacks and travertine floor tiles, there will be a tiler or worktop professional who can install the surface you need for your bathroom or kitchen design. There will even be tile and worktop repairers to help you if you need a quick fix-up to your surfaces. Tile manufacturers, worktop professionals, and often tilers in New Orleans, LA themselves, will also be able to advise you on the right materials to use if you’re not decided on one particular type. They can tell you the advantages of the different flooring, wall tiles and kitchen worktops so you can make the right decision for your home. If you’re after a bespoke tile pattern, mosaic or mural created and laid in your house, this will also be possible with Houzz as we list such a wide range of tile manufacturers, worktop professionals and tilers in New Orleans, LA. It could be the case that you can find a design or construction company that can offer tiling and worktops as part of their work, whilst also undertaking other projects for your house redesign, so it’s worth looking out for these professionals, too. Here are some related professionals and vendors to complement the work of tiles, stone & worktops: Interior Designers, Architects & Building Designers, Main Contractors, Kitchen & Bathroom Designers, Design & Build. Find a tiler or worktops professional on Houzz. Narrow your search in the Professionals section of the website to New Orleans, LA tilers and worktop installers. You can also look through New Orleans, LA photos to find projects you like, then contact the contractors or tilers in New Orleans, LA who worked on the tiling work or kitchen worktops.